The best energy company in the world! Thank you Cherry Energy for being the best energy company in the world. I love the fact that I can choose the prorated payment plan, and not have to pay the whole bill at one time. This is especially good for seniors and those on fixed incomes. My introduction to your company was Teri. She gave me complete information and an accurate quote. I also appreciate her great sense of humor. Seth and James did the installation. I was impressed with how respectfully they behaved. During the installation they asked if we cooked a lot and adjusted the burners for accordingly. Crystal followed up with a call to see if we are happy. By far the most amazing customer service you could ask for. Thank you for everything you have done for my family during my time with your company! Everyone at Cherry Energy has shown good Southern manners and charm with every interaction from the initial call to customer service in the field. We are new customers, but the friendly first call I had with Crystal clinched the deal. Seems to be customer service from the top down. To the Management, Administration and Staff… Within the last few years, we were not totally satisfied with our last heating fuel provider and wanted to make a change. We were aware of Cherry Oil’s services in Kinston and made a decision to choose Cherry Oil as our new heating fuel company provider. Thus far, my mother and I are elated over the awsome customer service the company has rendered. When I realized that our tank was empty on the day we encountered our last snow storm, I immediately called the customer service phone number; Crystal answered and was able to handle our dire need for fuel effectively, professionally and efficiently. On the company’s behalf, she apoligized for our inconvenience, being that we were new customers and had not accumulated a tracking record, and ensured that we woulld be taken care of promptly. Pat and James were an awsome team they provide a quick response and top professional service,; after they filled the tank they came inside the house to make sure the thermostat and fireplace pilot was working properly. They explained to us what they did and want us to be satisfied before they left. They even took their shoes off, in order to not track snow in the house, out of respect. These guys were friendly and represented the company in the way a customer would like to see it done. To the team’s supervisor, “Kudos,” to their efforts in satisfying a new customer. Let them know I am highly pleased that I made the right choice in selecting Cherry Oil as my heating fuel provider. Service is prompt and on time. A company that one can count on, A company that is honest, A company that is trust worthy. A company cares for its customers. A COMPANY WITH A HEART AND SOUL. I have been with Cherry Oil for several years and I have always been able to call them with my problems and they where here the very same day to make the repairs. I am a widow and having someone that you can depend on means alot to me. I recommend Cherry Oil to everyone. The Cherry Energy staff consistently go above and beyond to provide superior customer service. Every time I need propane refilled, Jason and staff are quick to respond. Keep up the good work! Cherry Energy offers great service. After moving into our new home, we thought we had a leak from our gas logs. Jason Cherry came right over to take a look and handled the issue with ease. Extremely reliable service! We at Integrated Container have had an outstanding relationship with Cherry Oil/Energy since the early 2000s. The service has been outstanding and the prices are competitive. As a matter of fact, when fuel needs are mentioned to me by my friends and clients, I always recommend Cherry. I have been a customer buying transport loads of fuel from Cherry Energy for the Anchorage Marina for many years. Their service, fair and consistent pricing and outstanding customer service make them a great company. In a prior life, I was the owner of a fuel distributor like they are and appreciate the extra effort they put into business. I have known the Cherry’s my entire life. I recently had gas logs installed and they were very helpful and efficient. Thanks, Cherry Energy! Customer service department is top notch. 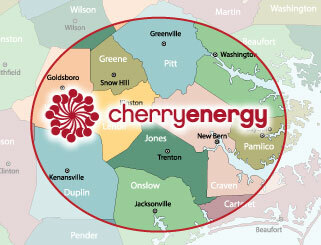 Cherry Energy provides excellent service! Their customer service department is top notch. They always handle any questions or concerns quickly and effectively. They have friendly drivers who are always safe when delivering gas to my home. I would always choose Cherry Energy for my gas company! Part of my job serving as Treasurer at Crow’s Nest Yacht Club in Atlantic Beach is purchasing fuel for the marina. We purchase tens of thousands of gallons of fuel each year from Cherry Energy and over the years have always received excellent service from Jay, Jason and the rest of their staff. Thanks for going above and beyond what we experienced with some of our other vendors in the past. My new stove finally came in. I contacted Cherry Energy and made an appointment that was convenient for me to remove my old unit and install the new one. They showed up on time as planned and all went well. Thanks. I have always had great service from Cherry Energy. I particularly like the equal pay program. The office staff are always friendly and willing to assist in anyway possible.